A Cotswolds Christmas break is a must for every individual looking for a fun holiday experience aside from the usual white Christmas. Of course, careful planning for your Christmas break in whatever part of Cotswold England you want to spend it in is also a must. Here are a few travel tips and a few of the best places to be in during this season. The English countryside is beautiful in all seasons but demands the right kind of personal gear to enjoy its beauty. Thus, your first concern should be the clothes including shoes to pack in your suitcase, which should be suitable for the winter months. During the winter season in Cotswolds, the temperature rarely dips below 0°C with the most usual being 4°C so thick Arctic clothes are unnecessary. The air is crisp, cold and with a good dose of morning frostiness on most days so wearing layers of thick clothes is advisable. Just dress according to the weather forecast for the day during your Cotswolds Christmas break with extra precautions for rain and you should be fine. We suggest wearing gloves, scarf and hat for protection against the cool wind. 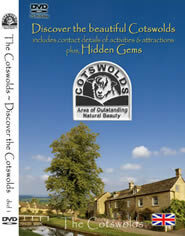 You are also well-advised to check for opening and closing times for the major attractions in the Cotswolds such as water parks, shops and entertainment centres.Keep in mind that many daytime attractions will close earlier compared to other seasons mainly because daylight is limited to 8 hours here. A few attractions are even closed during Christmas to accommodate maintenance procedures while others are open – say, the Gloucester ice skating rink – for the season. Christmas shopping at Broadway with stalls selling pig roast, roast chestnuts and mulled wine, among others. Carol singers, street entertainers and swing bands add to the festivities. 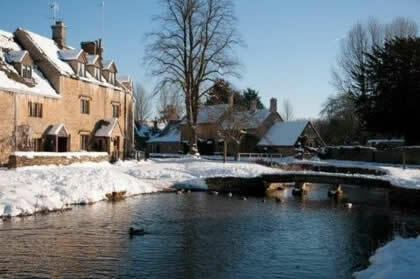 Christmas extravaganza at Bourton-on-Water with Christmas tree lighting as the highlight. Activities include listening to the jazz band choirs, enjoying Christmas drama presentation, and buying all sorts of holiday treats like pig roast and candy floss. Christmas race at the Cheltenham racecourse featuring 2 days of hurdle races, among other activities. Other notable activities are Santa Claus visits, magical Christmas fantasy light shows, and craft workshops, which almost all Cotswolds towns and cities have their own proud versions. Indeed, your Cotswolds Christmas break is a magical time filled with good laughter, good food and good vibes shared with family and friends. The magnificent beauty of the countryside reinforces the joys of the season and of living in Cotswolds England. Old Bell Hotel at Malmesbury in Wiltshire is a luxurious Cotswold Hotel reputed to be the oldest purpose-built hotel in England and dating back to 1220. A cosy bar,individually designed rooms, outstanding restuarant and impeccable service makes this a very appealing hotel in which to spend Christmas. Malmesbury is a typical Cotswold Market Town with quaint shops, eateries and cafes-it also has Royal connections with Highgrove House providing organic fruit and vegetables to the Hotel.